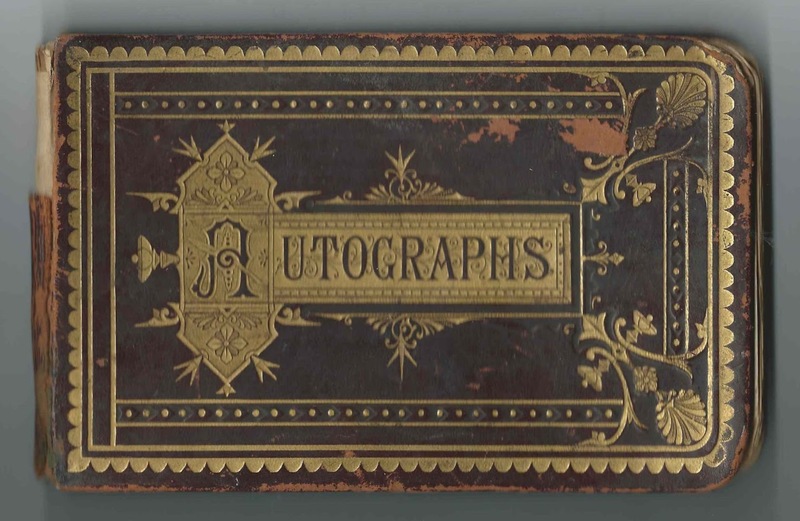 1876-1880s autograph album that belonged to Helen E. Comstock of the area of Warsaw, New York, and Canandaigua, New York. 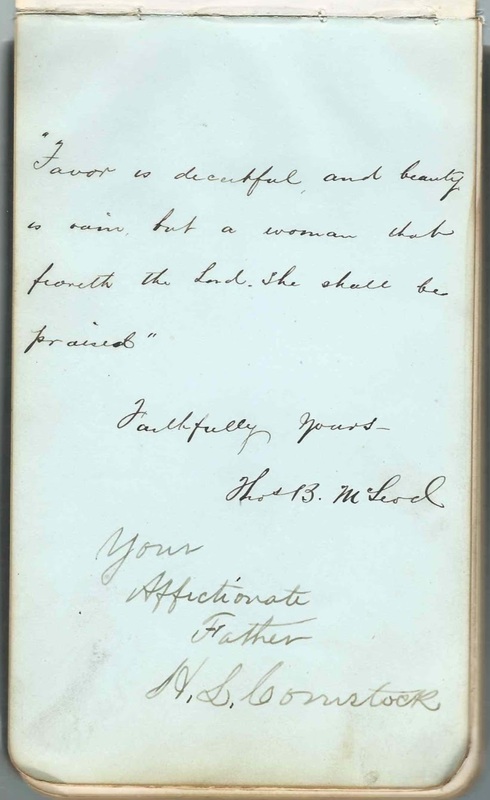 The album measures approximately 7" x 4-1/4" and contains the sentiments of 59 of Helen's relatives and friends. An alphabetical surname list and an alphabetical list of the signers, together with any personal information they offered, appear at the end of this post. Helen E. Comstock was born January 24, 1862 in New York, the daughter of Harlow Loveridge Comstock and his second wife Helen E. (Buxton) Comstock, who died a few months after Helen's birth. It appears that Helen went to live with her maternal grandparents Chauncey and Mary Buxton at Warsaw, New York. 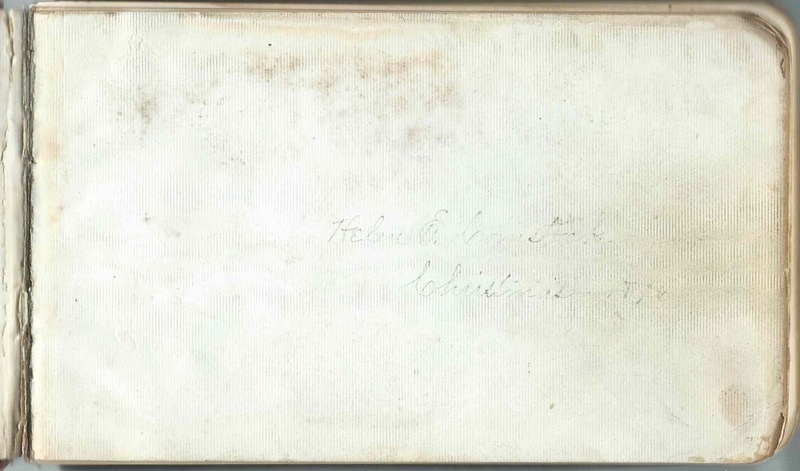 Helen's father Harlow Loveridge Comstock inscribed a page; Thomas B. McLeod also signed the page. Harlow died 24 September 1883 at Canandaigua, New York. Several signers indicated a family relationship with Helen; I don't know if they were full siblings, half siblings, step siblings or in-laws. There were probably more; refer to the list of signers below. Annah L. Comstock called herself Helen's sister on the 2-page sentiment she inscribed on January 4, 1877. Laura called herself Helen's cousin on the page she inscribed at Warsaw, New York, on September 4, 1878; she referred to bangs, so it's possible Helen wore her hair in bangs. Lucy Munger called herself Helen's cousin on the page she inscribed on "11-8-1878"
On December 7, 1882, Helen E. Comstock married attorney and businessman John Snow Rockwell, son of Daniel and Mercy (Burton) Rockwell. John was born April 20, 1854 at Pike, New York. John and Helen had two sons: Harlow Loveridge Rockwell and Kenneth Daniel Rockwell. John died in 1928 and Helen in 1948. 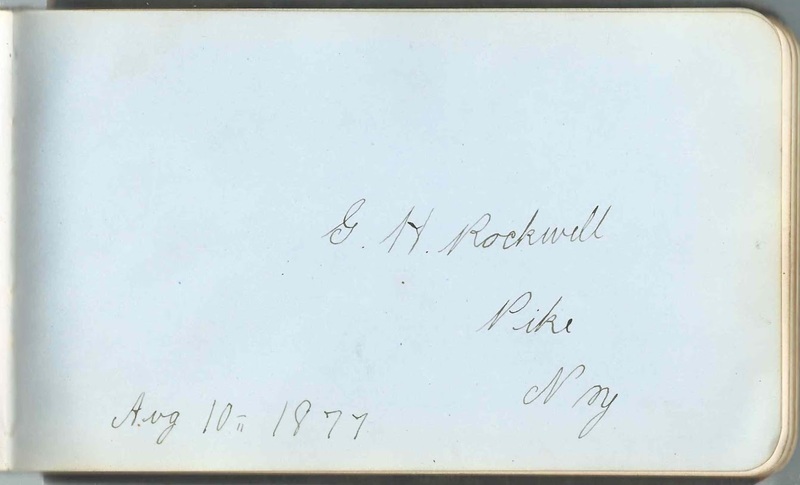 John Snow Rockwell and his brother George H. Rockwell of Pike, New York, inscribed pages in Helen's album, John on May 28, 1877 and George on August 10, 1877. 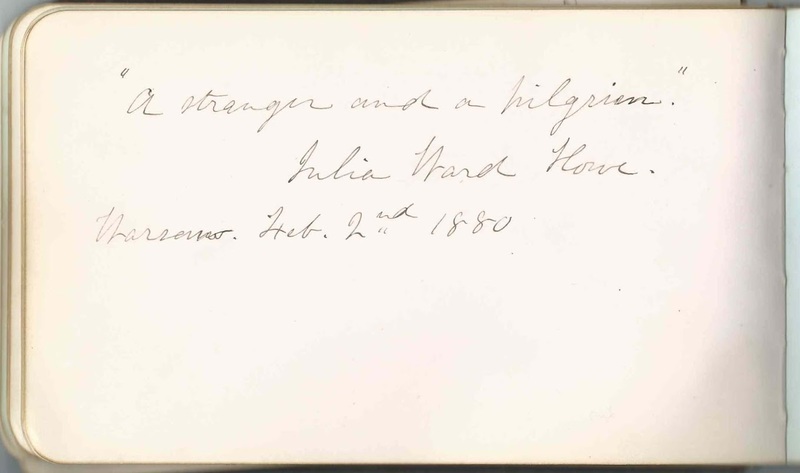 Julia Ward Howe inscribed a page at Warsaw, New York, on January 2, 1880. Perhaps it was abolitionist and social activist Julia Ward Howe on a speaking tour. Laura, signed at Warsaw, New York, on September 4, 1878; Helen's cousin. Refers to "banged hair", so perhaps Helen wore her hair in bangs. Edward Buxton, signed at Warsaw, New York, on January 29, 1877. 2-page sentiment left by Annah L. Comstock, Helen's sister, signed on January 4, 1877. Julia Ward Howe, signed at Warsaw, New York, on February 2, 1880. Perhaps the abolitionist and social activist Julia Ward Howe on a speaking tour. Harry C. Humphrey of Warsaw, New York. 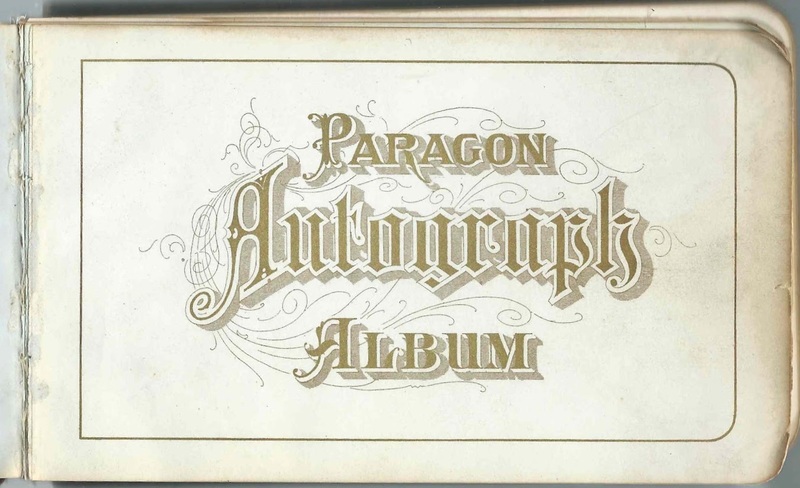 Year 1875 in upper left corner - this year was before the album was started. L. M. Lange, signed at Warsaw, New York; called himself Helen's brother; whether half-brother, stepbrother or brother-in-law, I don't know. G. H. Rockwell of Pike, New York, signed on August 10, 1877. Presumably George H. Rockwell, brother of Helen's future husband John Snow Rockwell. 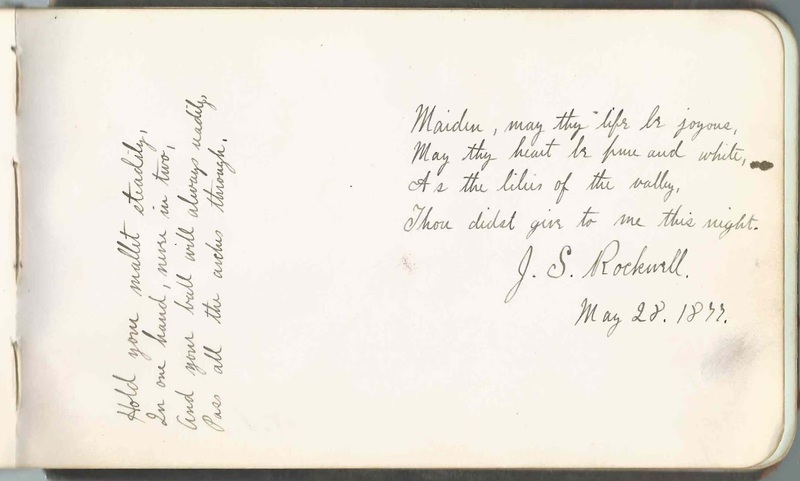 J. S. Rockwell, signed on May 28, 1877; presumably John Snow Rockwell, future husband of album owner Helen E. Comstock.